I’ve mentioned a few times on here how my food prep binges on the weekend really help me stay on track with nutrition throughout the week. I hadn’t really thought much about writing a post about it until I saw the awesome Lindsay over at the The Lean Green Bean do her weekly series on her food prep routine. I was so inspired by everyone else’s food prep, that I thought maybe I should give you guys a small peek into mine as well. So this past weekend, I snapped some photos while I set off one of my patented kitchen bombs. The first step for my food prep is to make a list. This shouldn’t surprise you. I’m pretty much the queen of lists. Ha! I did a little pre-list when I made my menu and went grocery shopping for the week, but now that it’s time to actually do the work, I make a “real” list and make sure to put it in the order I want to work. After my list is made, I usually pull out all the ingredients I’ll need to get through the whole list. I’m lucky to have a giant island to spread out on. Having all the ingredients out and clumped together really saves me some time. Plus, I also like the visual of working my way through them. I put ingredients away as I’m finished with them, and as the counter starts to get empty, I know I’m closing in on the finish line. To make the most out of my time, I try to start with the things that have an element of inactive work. Like making bread. 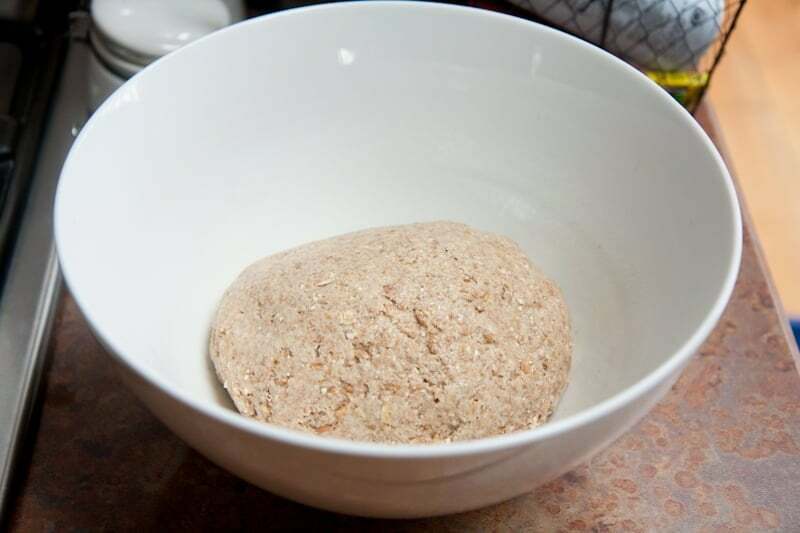 I make a loaf of bread each week, and I get the dough together and rising first, before I do anything else. Bonus: because I’m working in the kitchen and have the stove and the oven on, it warms up and my dough rises better. Win! …and then right after, I start working on my salads-in-a-jar. I’m not sure who the first person to think of putting a salad in the jar, but man, it is genius. I was skeptical when I first tried it, but just as long as the lettuce is separate from the dressing, it all stays fresh and crisp for days. My lunchtime veggie intake has skyrocketed thanks to these little salad jars stashed in the fridge. I usually dump the whole thing into a bowl, but Craig just shakes it up and eats it right out of the jar. It’s a a perfectly portable healthy lunch. Love ’em. Once I’ve made it through my whole list, I stash everything on the top shelf of the fridge. Not only does it make it easy to get to, but it’s also the first thing we see when we open up the fridge door. I’m a believer that if I’m visually assaulted with healthy foods, I’m much more likely to eat healthy foods. 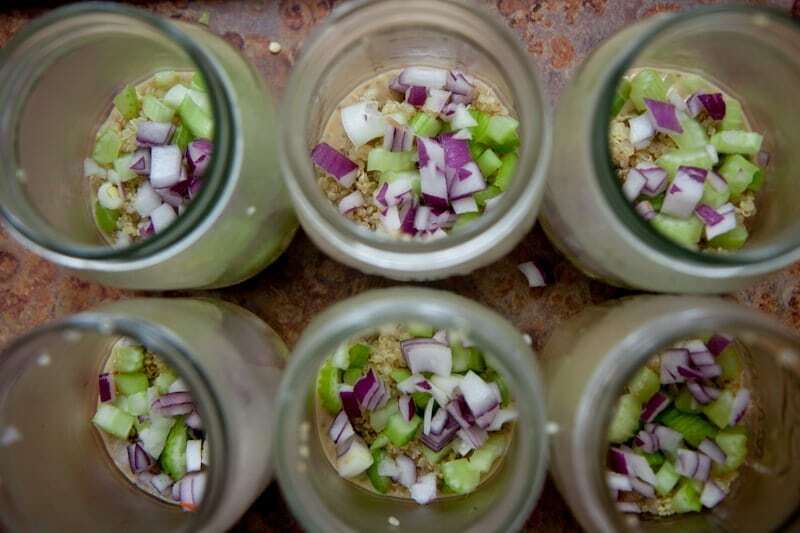 Salads-in-a-jar: lemon-sesame dressing, quinoa, celery, red onion, lentil sprouts, feta and romaine. This, plus some other additions like cereal for breakfast or leftovers for lunch, will be enough food to get us through the week. It took me about three hours to get through all this cooking, but I know it saves so much more time than that during the week. It makes it so easy to grab breakfasts, lunches and snacks during the week. Honestly, the time and effort isn’t all that bad. The worst part about the whole thing? The pile of dishes afterward. Yeeeeesh. But thankfully, I have an awesome husband who doesn’t mind cleaning up after I spent hours cooking us healthy, yummy food for the whole week. Each week, I try to make 2-3 options for lunches, 2-3 options for breakfast and a handful of options for snacks. It changes each week. Here’s another food prep I did a few weeks back. In this one, you’ll see other food prep frequenters like granola bars, overnight oats, fruit and yogurt parfaits, and tuna salad. It all just depends on what we’re in the mood for. If it weren’t for food prepping each week, my diet would probably consist of some leftovers and whatever food was within reach in the pantry. I know having all these fresh fruits and veggies ready and waiting has definitely made me eat more goodies. Even Craig agrees! He says that without the weekly food prep, he probably wouldn’t even bother with packing fruits or vegetables in the lunch he takes to work, but with it all there and ready to go, it’s actually easier to just grab something healthy instead of doing the work to pack something not-as-healthy. 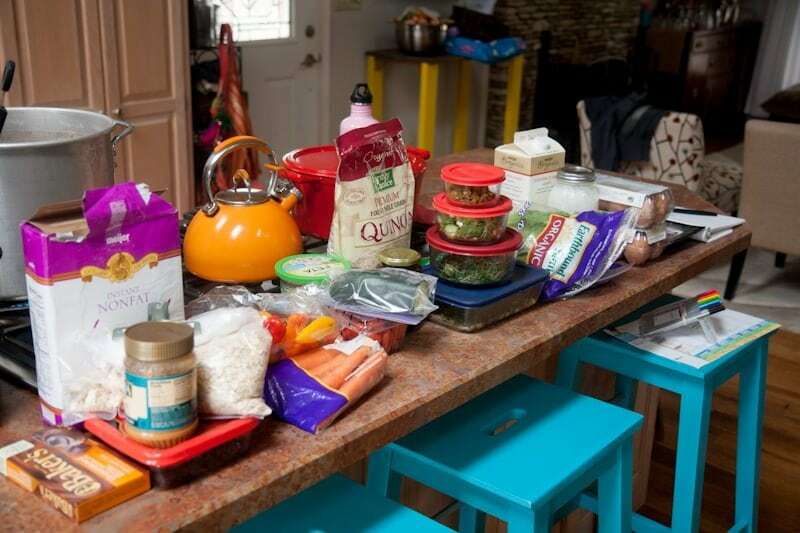 Food prepping takes a pretty big time commitment, but for us, it’s a system that works, so that time is worth it. If you’ve never tried it before, I highly recommend making your own list and setting off a kitchen bomb of your very own! Do you do food prep? What are you favorite dishes to prepare for eating throughout the week? Yeesh, Pyrex is just the best isn’t it? All that food looks delicious! I’m thinking about purchasing a food processor just so I can finally make those darn peanut butter cookie date balls that call my name whenever I happen upon your blog. I do some food prep on the weekend, but I actually love to prepare my meals during the week. There’s something therapeutic to me about taking some time each day to chop my veggies. love this!!!! thanks for the shoutout!!! On sunday, we get our groceries (list and meal plan done) and I usually make some kind of snack for the week (banana muffins, date balls, granola bars). We usually stick to our meal plan, and make enough to have leftovers for lunch the next day (even though I work at home, it is so much easier – decision wise – to have a ready made lunch). This just leaves breakfasts, and my husband always has cereal and almond milk, while I generally have a piece of fruit and Greek yoghurt/whatever snack I made. I’m one of those people who likes knowing what I am going to eat, so prepping/planning works very well for me! what is in your cherry chocolate smoothie? I have tried to make smoothies for 2-3 days but they always turn out gross. The first one is YUM then the second one is just kinda gross and the third one is just nasty. I put protein powder in, do you think that is what makes them gross after a few days? Great blog on meal prep! My kitchen looks the same after meal prepping! :) But those dishes are worth having your whole week mapped out! Protein powder does tend to go yucky in smoothies pretty quickly. I’d try adding it right before drinking and then shake, shake, shaking really well! This is a great post! I usually do some prep on the weekend as well. I cook a batch of grains, clean veggies and make a pot of soup. But I’m curious. How long does the salad in a jar and the fruit and yogurt parfaits stay fresh? I would love to do something similar for my kids lunches — but not sure how far ahead I could make it before it would be yucky. oh…. and smoothies too? How long? A day or two? I notice you use plastic bottles for your smoothie. Is this what keeps them fresh for the week? Nope, not plastic. They are glass bottles with plastic lids. I’m not sure if that has any difference or not. I use freezable canning jars w/ plastic lids for smoothies and freeze them. They thaw quick enough and then they stay good until I am ready to eat them. 8 oz jars for side smoothies, 12 oz jars for full portion. I subscribe to once a month meals to do bulk cooking days. They have great recipes, too! This may be a dumb question, but this is JUST for lunch and breakfast, right? My husband and I meal plan dinners for the week and I make enough for a family of 6 each night (2 servings for him, 1 for me, 2 lunch servings for him, 1 lunch for me!). I’m starting to wonder if it might be cheaper/more cost effective to do a normal dinner serving and do some lunch prep like this. Thoughts? Yup, just lunches, breakfasts and snacks. We meal plan dinners too, and we often have leftovers, but we use them on leftover night for dinner or for lunch if we’re not interested in any of the food prep stuff. I have no clue if it’s more cost effective. We are not at all skilled at squeezing money out of our grocery budget. We spend a lot of money on food. :) And I’m okay with that. I think first things first I need to buy some good containers for food storage like it looks like you have. I do have a lot of good wide mouth mason jars, but they don’t work for everything. I bought a set of plastic ones at Ikea but they melt. MELT!! Ugh. Hmmmm! That’s super strange Rosie, because I’m using pretty much the exact same set up as you and am not having those problems. The feedback is definitely helpful! Would you mind sending me a screenshot to backtoherroots@gmail.com if you have a spare second? It might help me diagnose what’s going on. Thanks for letting me know! That salad-in-a-jar idea is brilliant! Would you consider writing a post with a couple of easy variations (not too many ingredients)? I would love it, since I’m always in search of healthy packed lunch ideas that I can throw in my purse in 5 minutes or less :) and I’m sure I’m not the only one! Yes! I would LOVE to know more about the salad-in-a-jar idea, too! What size are the jars you use for the salad-in-a-jar? What a wonderful idea. I am on day 7 of the 24 day challenge. All the tips I can get are helpful. Love this! I would love to see a photo of this every week… it would really give me some great ideas! WOW! You are an inspiration to food preppers everywhere! Are you at home to consume this food all week? I love your very orderly group photo of the finished product. Thank you for sharing! Have a great day! I have made a giant bowl of salad for the week, and made a main dish or two to have leftovers, but I’ve never done that much comprehensive food preparation,and I can’t wait to start! I think it will make a huge difference in getting through the week with unplanned indulgences due to laziness (confession!!) and when I start working again it will be one of the best ways to transition back to full time work after over 18 months off. Yep. Can’t say I’ve ever done any food prepping! My breakfasts and lunches are pretty simple, though, so I haven’t really felt the need. I will eat oatmeal or granola for breakfast, and leftovers from the night before for lunch. I do want to add more salads to my lunches, though. Easy way to get in more greens! Cassie! I LOVE, LOVE, LOVE this idea! I am on my way out, right now, to Walmart to see if I can locate some cheap jars. The salad in the a jar idea is pure brilliance. My plan, this afternoon, was to get some things together for lunches and dinners this week, and this food prep blog has completely inspired me! Thank you! Man! You’re so organized! I’m impressed. I am loving all the meal prep ideas out there lately! I’m a huge Sunday food-prepper. For breakfast I love oatmeal bakes, egg sandwiches to pop out of the freezer, hard boiled eggs and homemade bars. For lunch I also love salads in jar or SOUP. Love soup. Also, leftovers! For snacks I usually just have fruit, popcorn or yogurt. I also chop all my veggies/do any long prepwork for dinner recipes on Sunday. It makes the week so much easier! Wow! That’s amazing! The most I ever do is that I’ve started making two servings of dinner each night and packing one right away for the next day’s lunch. I don’t know if my brain is capable of being this organized. Your things look really yummy too. In my house, food is a challenging thing… Thus, meal planning can be a little challenging. I’m a recovering picky eater who’s trying to expand her palate to include healthy things (like vegetables) but that process is still filled with a lot of anxiety. My partner is an unapologetic picky eater who has no desire to change his habits, he’s a meat and potatoes kind of guy and thinks that things that are green are gross (with the notable exception of mint ice cream). Our roommate will eat anything you put in front of him, but you have to constantly remind him to eat the food because he doesn’t want to be a bother. My partner has a few dishes that he likes to cook on his days off that stock the fridge with something to eat… Lasagna, roast beef hash, and scalloped potatoes. Beyond that… There is no meal plan. I have to ask – do you keep the smoothies in the freezer or fridge? I generally make smoothies the night before and leave ’em in the fridge, and even within 12 hours they get kind of liquid-y. Or maybe I am too picky. ;) I love the new design, btw! In the fridge! And it depends on the ingredients. Just as long I don’t include greens or thickeners (like chia or flax) it’s always fine for me. Another option, that I do for my green smoothies, is to chop up all of the ingredients eg. (cucumber, spinach and pineapple) and put them in individual bags in the freezer. That way, when I need to make one I just empty a bag into the blender and add cocount water. This was a great post – time for me to get more organised! I prep my smoothies for the week ahead of time too. I use bottles from Kombucha that I bought and drank and peeled off the label. I make sure to leave some room at the top, then put them in the freezer. Let them freeze overnight before putting the top on. In the morning, I put one in a hot water bath to defrost while I do other morning tasks and get ready. Love your prepping ideas, Cassie! I’ll definitely be trying some of those. Thanks for sharing! I add a little water to my containers of cut-up carrots and celery to keep them from drying out. Keeps then tasty all week!! And — although it’s an added expense — my latest favorite things are the individually portioned cups of hummus from Costco! I just grab a handful of veggies from my container, toss in a little pack of hummus, and I’m on my way! Thank you for sharing this bit of genius…I’m on track to do this- love the uniform pyrex containers- very visually appealing too- and I tell ya food is so much about that…and of course taste and reachability. I’m feeling motivated to make this my own! Hey Cassie it’s me! (Corrie from Blurb Column, now Casa Beebe.) YES YES YES! I food prep regularly on the weekends, including an inventory of the fridge/freezer/pantry, menu, grocery list, shopping, and then prepping for the week. 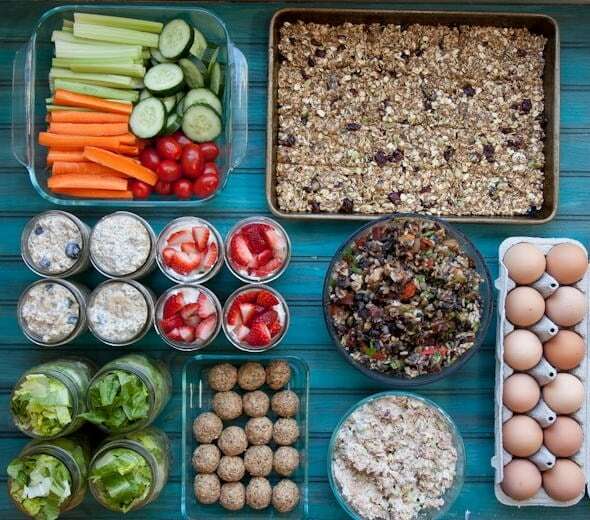 Lots of chopped veggies, cooked grains or eggs, other easy to grab snacks, lots of fruit. This is SUCH a lifesaver for me. Like you, if healthy food is easy to grab I eat it. On the weeks that the food prep/menu planning doesn’t get done we are about 1000 x’s more likely to eat out multiple times, or just eat junkier food overall. Food prep is where it’s at! wow…. I’m throroughly impressed by this!!!!!! wow, you are so organized! i can see how all this work and organization really helps to keep you on track… wish I could be this way! i just dropped in to your amazing space from foodgawker and I am completely awed by the idea of food prepping to this extent and specially the salad in a jar. You have the dressing on the bottom, and hte lighter foods n top so when you want to delve in to them you simply give it a good shake…is it a mason jar? I love love love it! Do the greens/lettuce stay crunchy? That really helps as the greens sometimes wilts by the end of the week….Looking good and inspiring me to try it out too! Yup, just as long as you keep the lettuce away from the dressing (and any other juicy veggies like tomatoes), it’ll stay crisp all through the week. I am so inspired right now. I really enjoyed reading this and now I’m super excited to get started on my prep this weekend. Thank you so much! I’ve never heard that cutting veggies makes them lose nutrients, interesting! I’ve heard that they start losing nutrients the second they are chopped of the stalk and when they are cooked, but never that just by cutting them into smaller pieces. Do you have any sources I can read up about it to learn more? Thanks! I’m sorry, this information comes from dutch dietician books, so, I don’t have that information in English. María I. Gil, Encarna Aguayo, Adel A. Kader. “Quality Changes and Nutrient Retention in Fresh-Cut versus Whole Fruits during Storage.” J. Agric. Food Chem., 54 (12), 4284 -4296, 2006. 10.1021/jf060303y S0021-8561(06)00303-7. Accessed May 5, 2016. http://pubs.acs.org/doi/abs/10.1021/jf060303y. I still intend to precut my vegies. If I don’t, I don’t eat them. And slightly less vitamin filled vegies is better than no vegies in my opinion! I notice you used all glass containers/jars. Does this keep the food/drinks fresher versus using plastics? I’m actually not sure! We switched to all glass a few years back (before I started prepping) so I’m not sure if that makes a difference or not. Glass is definitely better than plastics for foods where there might be a risk of chemicals from the plastic leaking into the food. It’s more likely with liquids and things containing fats and acids. Probably doesn’t make much difference for carrot sticks, but I think you’re wise to go with all glass anyway. I used to food prep all the time when I worked, now that I am home with the kids, I don’t. The reality is, I should food prep more. For me and the kids. Thanks for the ideas! Really cool post! Very inspiring. there’s not much to worry about anyway, since you keep the veg in airtight containers in the ‘fridge and eat them within the week. And it seems to me that doing it this way means you get to eat more veg anyway, especially raw, which would more than make up for any slight loss of vitamin C and carotenes, the only things seemingly affected. I love your blog!! !…Your simplicity and honesty! Please post some dinner prep ideas: what you do ahead that pays off the same way your breakfast/lunch ideas do. Years ago, when my three children were small and I was working full-time and going to law school evenings(! ), we managed to eat well by using week- end food prep. I was actually learning to cook from Julia Child , James Beard,and Joy of Cooking. The key thing that proved most helpful was that I made three big dinners, doubling them (baked ham, beef stew, roast chicken, for example) and eating a dinner meal from each every other day. For lunches, we would make sandwiches with the left-over roast meats or add them to pre-prepared veggies for healthful, yummy salads. On the next week-end, I would use any left-overs to make split pea soup, chicken soup, and pot pies with the last of the ham, chicken, and stew. To that, I would add another roast, such as pork, and make some meatballs for a pasta dinner and /or a rice dish. Baked fish and shrimp were additional staples. Preparing veggies on the week-end was a huge help. We had a running contest to see how many different veggies we used to make salad— often we managed to have nine! Also, I made a point of buying fruit in season, generous amounts, so it was always available for snacks or dessert. Wow, this is so inspiring! Love it! Thanks for sharing your process and providing inspiration. I can’t wait to do more prep. I completely agree that having healthy “grab and go” food is the key to eating better. I love your ideas, I prep on Sunday and Monday, I add tuna sslad and potatoe salad and cole slaw and egg salad. i make little differences every week. The blessing of fresh homemade food keeps us from being bored. I love your pictures and will do the same this week. Love your blog!!!! A friend forwared it to me and described it as “inspirational” I too think you are inspriational!!!!. Thanks..
One question, what is the recipe for the item on your “How I Prep Food for the Week” just to the right of the salads in a jar??? Looks like a mimi quiche and it looks yummy! I just found this post and it’s truly inspirational! Thank you. Also, while searching for other ideas I found that your photo was being used by Sensa with no attribution. Just thought I’d say something because I know how hard bloggers work for their photos and posts. I really love the idea of baking a loaf of bread every week and the salad in a jar. I am going to give meal prepping a try (after I clean out my fridge..yikes!) Thanks! This is such a fantastic way to operate, I have never thought of taking it to this level but it really makes sense. I am a long hours, come home and grab whats convenient kind of girl and I can tell that this would solve all my problems. A wonderful way to be organised. Thanks so much for sharing! I’m definitely going to try this. Have tried the salads-in-a-jar, herbed turkey and egg cups, overnight oatmeal, peanut date balls and black bean sliders (I made full-size burgers). Yum, yum, yum! Thanks for sharing – super helpful. 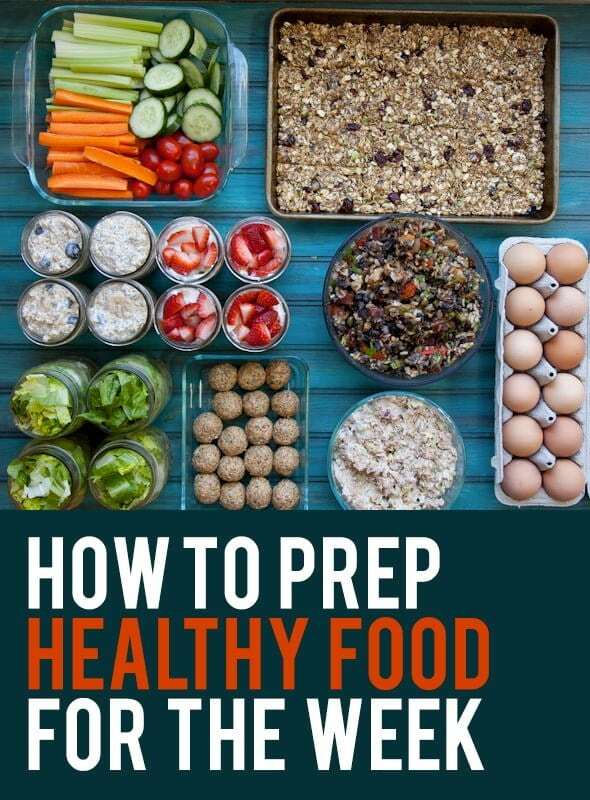 Love this food prep post! Do you have a link to the chocolate cherry smoothie recipe? That looks delicious! Finally. Someone who uses glass instead of plastic or aluminum. I was wondering if you could share a simple meal plan for the week. You’ve showed us your food prep and materials…but could you share a list of M-F what you have as options for each B, L, and D? This would help me as I’m currently doing a lot of food prep and researching other people that do this as well. I think I end up picking way to many options and making way to many different things. 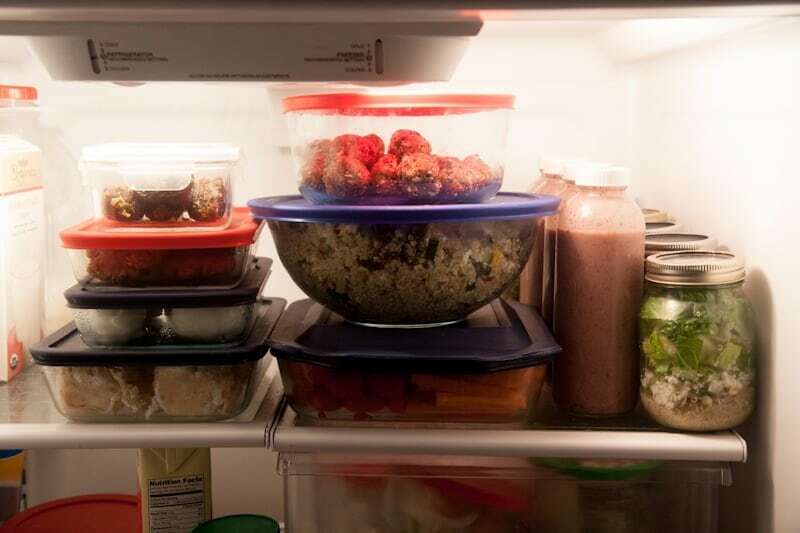 Do you end up repeating a lot of meals the way that you prep your food? Some nights we will have a Kashi pizza, soup and salad, fruit salad or add grilled chicken, chicken/veggie tacos, quinoa goulash, spaghetti squash bake, grilled chicken breast with veggies, ground turkey sliders. These are some of our go to usuals. But there are so many different things we do for dinner (and we have leftovers as well) it normally engulfs the fridge and we spend a lot of weeknight cooking. I think right now all the prep I’m doing ends up being for breakfasts, lunches, and snacks. Some of the veggie slicing prep helps with easy dinner salads, etc. Such awesome inspiration, I really need to get into this habit for sure! Truly inspirational! Exactly what I needed to kick my year off right! Your a ⭐️⭐️! Happy healthy New Years!!! I always feel better about the work week if I have my lunches already made. I’ve been on a big kale Caesar salad kick…I make it with nonfat Greek yogurt and almost zero olive oil and toss in a can of cannelini beans for extra protein. It lasts forever. But today I made your Greek salad..delicious! Reminds me tabouli. Great prepping!! 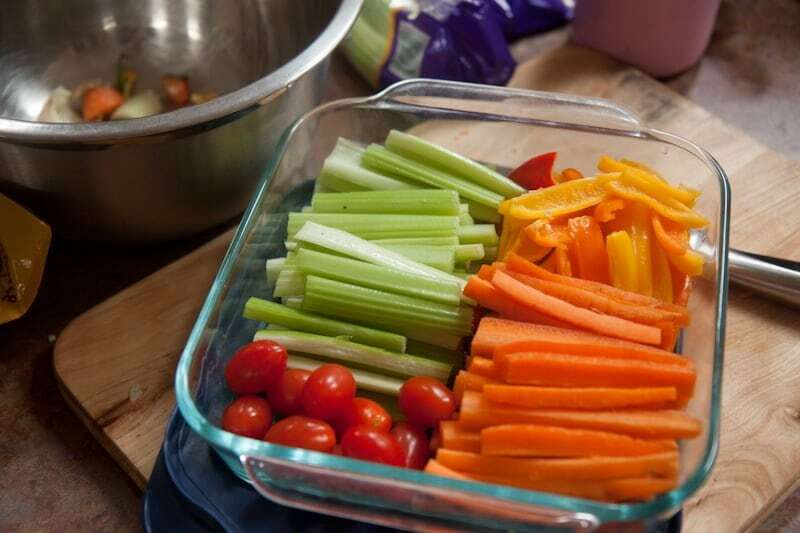 Do your cut veggies stay fresh in the 8×8 glass dish and for appx how many days? Trying to come up with something that will keep them fresh too! They’ll last dry for a few days, but they can last much longer if you store them submerged in water (even ice water, if you have a cold enough fridge). My grandparents always had an old gallon ice cream container with ice water and cut carrots, cauliflower and celery in it in their fridge for snacking! Great blog! I shared it in my Facebook group that I run — I think it’s going to help a lot of the viewers out! Gorgeous pictures and fantastic meal ideas! I’m prepping to do this tomorrow (Sunday) to help have a better week food wise this coming week and this was a huge boon to my planning phase. Thank you! great info here! what containers do you use to store the smoothies? are those reused water bottles? Love these ideas! Just wondering, how long do the smoothies usually keep? This is an awesome idea! I love doing food prep! This all looks so delicious too. This is great! I was wondering what your food budget is like? I have been cooking more clean and my budget has gone up. Can you do this on a budget? Our grocery budget is $500 per month. And YES, you can do this on a budget. In fact, I think it’s better for a budget, because you are cooking in bulk and avoiding eating out! Hi. I just found your site and love it! How many people do you feed on 500 a month? Also, do you keep count of calories? Thanks. This is so helpful – thank you! I just started working with a nutritionist and know this approach will really help me to improve my eating habits! 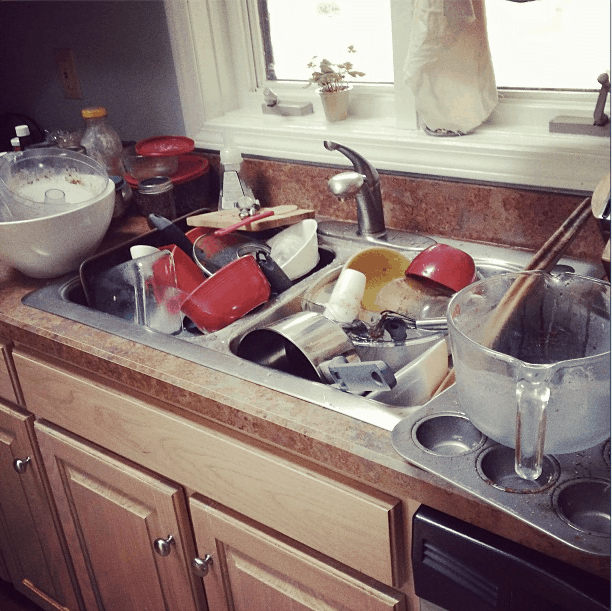 Are you prepping for two people? You and your husband? Do you have a recipe for the cherry-chocolate smoothies? Thanks! Do you know how you can inspire people around whole world? Yes! You inspired me here in Brasil to use this food organization. our no-time-life prejudice our diet directly! thanks for the willingness to share your routine with everyone! I hope to continue using your knowledge fot the health of my family!!! Thanks again!!! This is seriously the first time I feel ready to do it! And I have read many…and popular ones! What kind of containers do you use for food storage? Wow! This is really impressive. I am going to have to start doing something like this. Usually I just eat at vegan restaurants like these ones http://www.thebrookeeper.com/food/5-awesome-vegan-eateries-you-must-try/ whenever I am lazy! Keep it up! Do your smoothies stay good in the fridge being already blended up? I’ve wanted to prep smoothies before but get worries and put them a few days later and being separated. Thank you! I have been looking for a good post about how to keep healthy meals handy, for the week. This is very helpful! Hey… First time reading your blog. Great ideas! Curious if you would share your granola recipe. Been trying some and haven’t fallen in love yet. Do you make into bars? Going to do some prep this week! I buy my fruit and vegetables and chop them into manageable sizes then into ziplock bags and into the freezer. I’ve had a Sleeve Gastrectomy (stomach surgery) 27th November 2014, so I need to concentrate on getting protein in first then anything else is a bonus. Only able to eat approx 150ml of anything, so a typical meal consists of frozen portion of fish plus whatever rainbow assortment of veg I can do. If you keep ’em in a bath of cold water (and change it out every few days), they stay nice and crisp. You actually make it seem so easy with your presentation but I in finding this matter to be really one thing which I believe I would by no means understand. It seems too complicated and extremely extensive for me. I’m taking a look forward for your next publish, I’ll attempt to get the grasp of it! I love food prepping. My kitchen is my laboratory. My favorite things to prep for the week is fruit, vegetables, beans, stir fry, chili, vegetables soup, turkey breakfast sausage, biscuits, chicken, ground chicken or ground turkey. I can go on and on. Plan to start a food prepping business. If you know anyone who lives in the Atlanta area I’d be glad to assist them with food prepping and cleaning service. Hello, this is fantastic! Is there a shopping list that goes with these recipes? I may have over looked it on the blog. LOVE these tips! So healthy and convenient for during the week! On August 12th we actually want to share your article on our website for our readers to see how simple meal planing can be! Check it out! Yout tips are practical and great! We always recomend to our clients to make sure that they you have to plan healthy, it’s not an accident. Excellent job! Looks delish!! Can you share your recipe for granola bars? Thanks for this post it is so helpful! Hey Cassie! I came across this link on a recent Buzzfeed listicle and I absolutely love this! I’m striving to eat more balanced meals but often just don’t have the energy beyond cooking what’s within reach (and it’s normally not the best foods for me). I was going to experiment with grocery shopping and meal planning on the weekend and scheduling times to cook throughout the week, but as someone who works really well on momentum, I love this method! I recently moved from my hometown of LA to Southern Indiana (so a bit of an inverse of your story as well as a mirror to it currently), and will be moving to Louisville soon, where I hope to implement techniques like yours in my house once I gain more control over the kitchen and pantry. So glad to meet and learn from someone so close by! Welcome to Kentuckiana! :) Shoot me an email anytime you want to talk about stuff in the area. I love meeting new friends! Hi there! Love that you shared this! I too prep almost all my food for the week to stay healthy and on track! I never really thought about posting what I do on my blog either but I think you may have inspired me to re-think it! Thank you! Do the smoothies actually last well all week? Do you have a recipe for those? In the second picture at the bottom, is that a pan of granola bars? If so, would you be willing to share that recipe?! Thank you, thank you, thank you. This is wonderful and the ideas are fabulous!! I would like to do a sight with photo’s and recipes like yours, but you are just perfect!!! Thank you for sharing!! Is that what you posted is for a week and for two of you? Looks little !! Or it’s enough? Can you please give us ideas always on what to prep. I find this so confusing !!!? how to decide! your my new favourite person! Everything looks delicious & I love how easy it is to eat healthy food all week.when you do this! I linked to this on my blog, too. 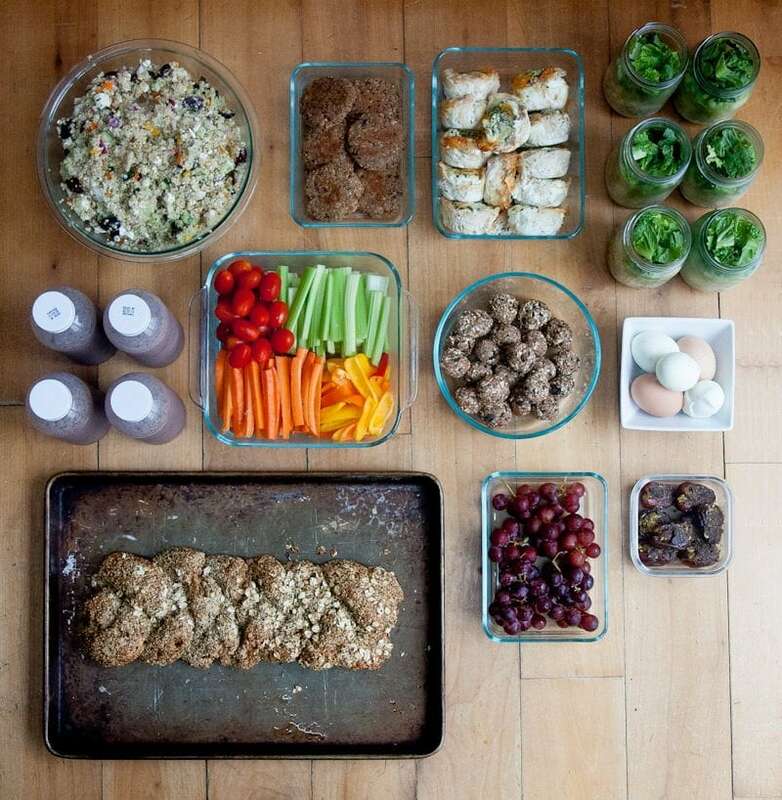 Thanks for sharing your awesome meal prep! Wow! Thank you for posting this. It encouraged me to blog about my meal prep. For breakfast (oatmeal jars, farina, veggie omelette); 3 roasted/grilled/broiled/baked fish or chicken; 3 starches (rice/quinoa/sweet potatoes); 3 veggies (baby spinach, tuscan kale, 3 other veggies); snack (green fruit smoothie, fruit, granola); extra protein (crockpot beans, lentils, whey protein). I usually keep my veggies and carbs on the simple side (chicken base, sea salt, peppercorn medley) just in case I want to use them for a salad toppers, in soups, or a side dish for any ethnic dish. I usually season my meats for a selected ethnic theme (cuban, italian, hispanic, caribbean, american, etc). I usually make at least one ethnic dish each week so I have something exciting to look forward to. I mix and match to minimize boredom. Most of the food I cook is portioned out in 1 cup servings, placed in plastic storage containers and frozen. This way, if I do not get a chance to eat something, I can eat it the next week. Do you have menus that I can put together for my meal prep? Thank you very much for the post. This is he first time I saw your site and I’ll sure come back. I’m a beginner in meal planning so the posts like yours help me a lot. Thank you. Thanks for this post it’s so helpful and informative! By the way I really enjoy your post name change and all. Hi! I’m just beginning to food prep for my partner and I but am confused about the correct way to start, we just moved into a new house and got a costco membership! We have gone over your recipes and LOVE all of them. But here’s the real question: we need to make a beginning shopping list, what needs to be on that list? Can you make a “must-have” fridge and pantry list? so we can slowly build our stores! Thank you so much! Thank you for all these ideas. What size are the mason jars that you used for the salads? We usually use pint jars! Great information! I agree that weekend prep is a huge factor in my family eatting heathy, staying on budget, and saving time. I develop our weekly menu and grocery shop on Saturdays and then complete the food prep on Sundays. I prepare three week evening meals and snacks. Each night I blend the smoothies for breakfast while cleaning up the evening meal food. Since I work from home, I just throw together the left over ingredients from the prepped meals and create something for my lunches. Silly question but what do you eat on the black bean burgers? If anything? no bun I am assuming? Thanks! As for me, during the week I try to eat all foods containing vitamins, including fruits, vegetables, cereals, fish and meat. The only thing I don’t like is cooking food:) Thanks for sharing! This looks amazing. 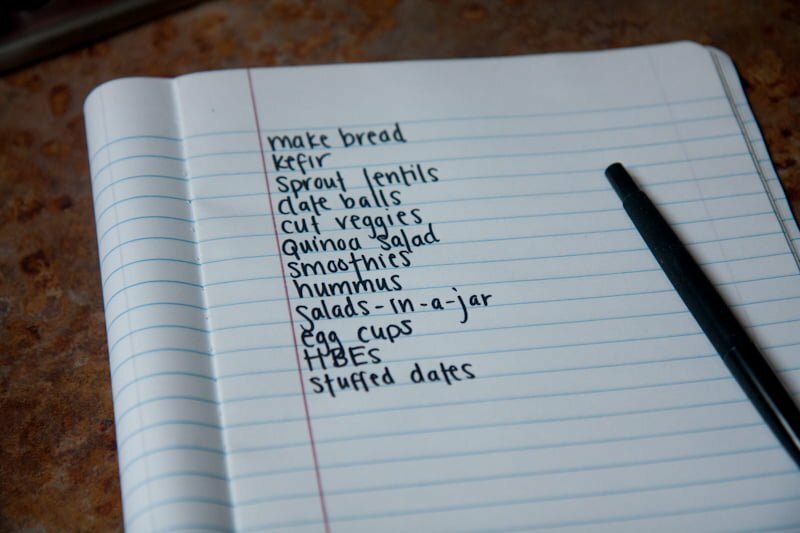 Do you have a grocery list for all of these items? How do the salad in the jars keep fresh for 3-4 days? This is absolutely magnificent, scrumptious, delicious and healthy food! I found your post from Pinterest Cassie! Thx for sharing! I love your website and have learned so much.